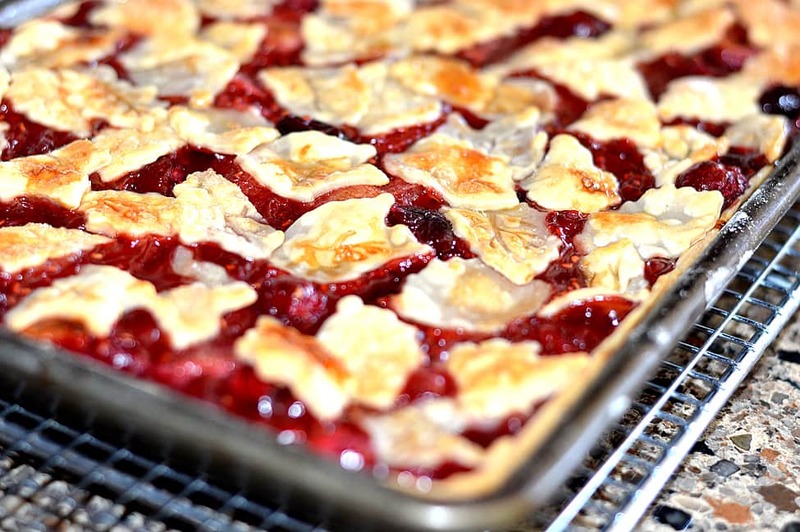 A slab pie is simply a shallower version of a regular pie made in a 9 x 13 sheet (or jelly roll) pan. Why deviate from the norm, you ask? Well, for starters, it feeds more people than the traditional 9″ round will. Second, I am not a baker and this was an absolute breeze compared to my previous attempts at pie-making. “Less fess, less muss” as my grandmother used to say. 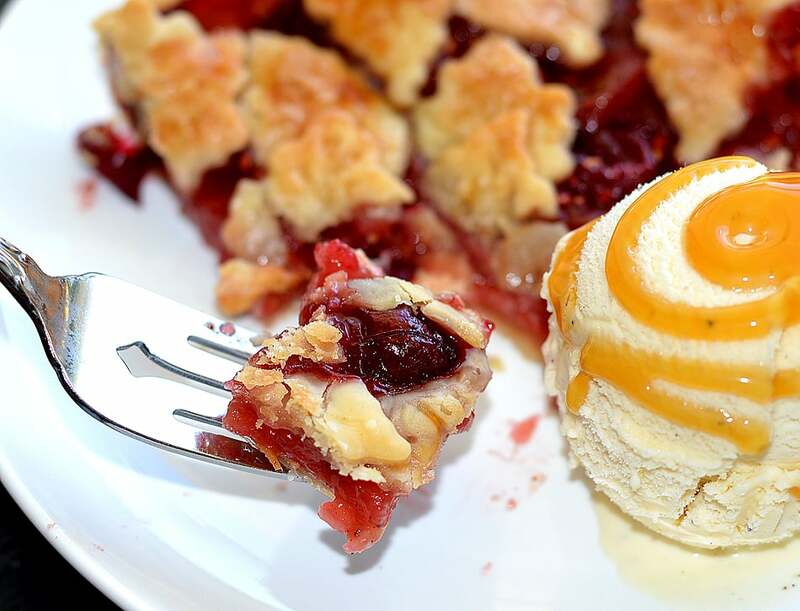 The best part about slab pies, is that you can literally make them with any fruit that is in season. It’s nearly fool-proof! 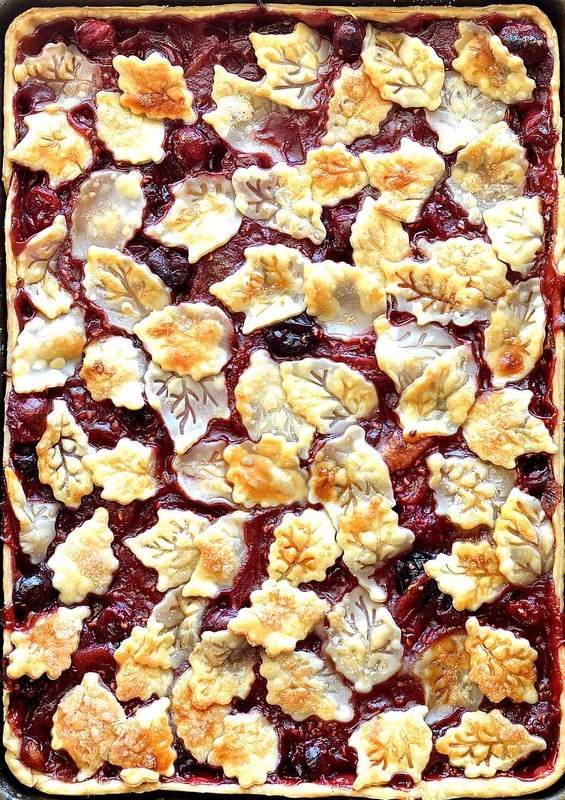 This Vegan Apple Cranberry Slab Pie begins with peeled and sliced apples, frozen cranberries and frozen raspberries. Add a little sugar and a splash of orange juice, along with spices and 2 Tbl of flour to thicken the juices. Bring to a boil over medium heat, then reduce the heat to a simmer. Cook, uncovered, for about 10 minutes or until the apples are tender and the juices have thickened. Stir occasionally and cool completely. The next step isn’t mandatory, but I like to refrigerate the mixture to get it a bit thicker. I actually made mine the day before. I wish I could take credit for the pie crust, but I actually use this one from Ina Garten and just substitute vegan margarine. Comes out perfect every single time! The important thing to remember is that this pie does not call for a thick crust, so flour your surface well and roll pretty thin. I contemplated creating a lattice design on this pie and then I remembered, I am not a baker. The mere thought of trying to cut pastry into perfect strips was stressing me out. I had purchased these pie crust leaf cutters last year and had yet to use them (you know me, I love kitchen gadgets). They have little plungers, so you first use it like a cookie cutter and then give a quick, but gentle press of the plunger to create the veins of the leaves. I absolutely LOVE how these came out. I guarantee at least one more pie this season will be seeing these on it! But let’s get back to the preparation. The now-cooled filling is spread evenly over the bottom crust and decorations are scattered all over the top. In retrospect, I might have added even more because they add that little crisp to the top. I brushed them with almond milk and sprinkled with sugar before baking. The pie goes into the oven for about 40 minutes or until golden and crispy. 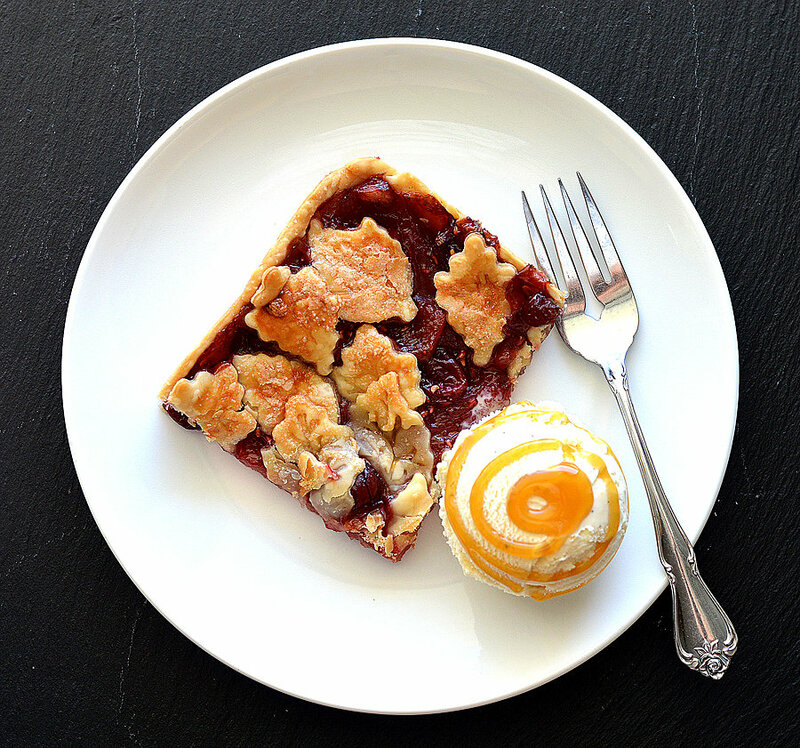 You definitely don’t want to under bake this pie or your bottom crust will be mushy. I cut it into 12 generous squares and served with vanilla almond milk ice cream and homemade caramel sauce. Soooo good! To make the dough, I like to use a food processor and VERY cold ingredients. I pulse just until incorporated and then place in plastic wrap, chilling for a few hours. This recipe makes enough for two 10" rounds, but we'll be using a quarter sheet pan (or about a 9 x 13 baking pan would also work). You'll line the bottom and come up the sides about 1/2". Roll the rest for decorations. I used these fall cookie cutters (link in blog post). To create the filling, combine all ingredients in a saucepan and bring to a boil. 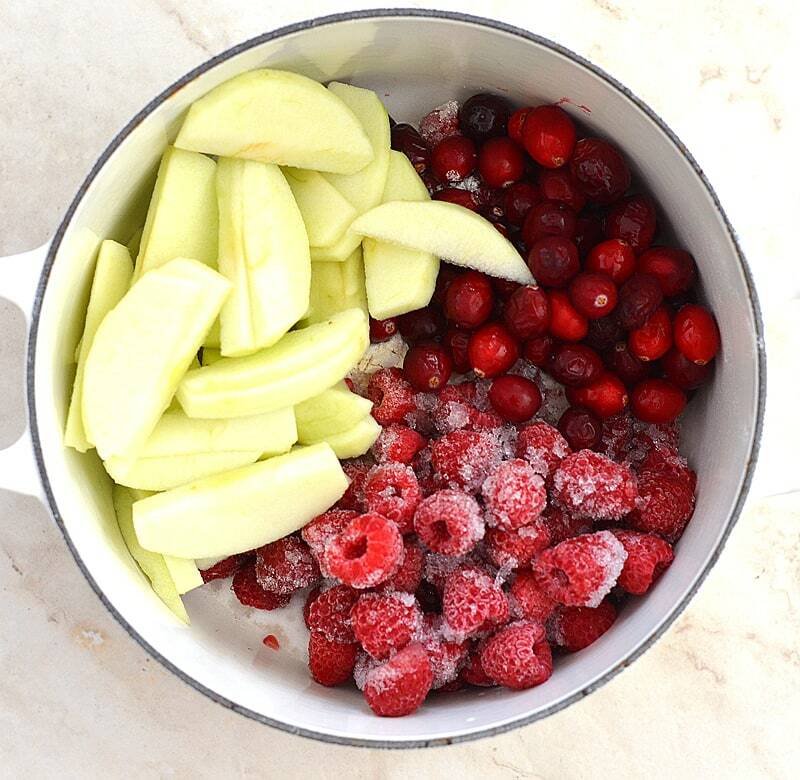 Reduce heat to a simmer uncovered for 10 minutes or until apples are tender and juices are thickened. The juices will continue to thicken as it cools and I like to refrigerate to bring to its full thickening potential. Roll dough thinner than you would a traditional pie on a floured surface. Line the pan and come up the sides about 1/2". 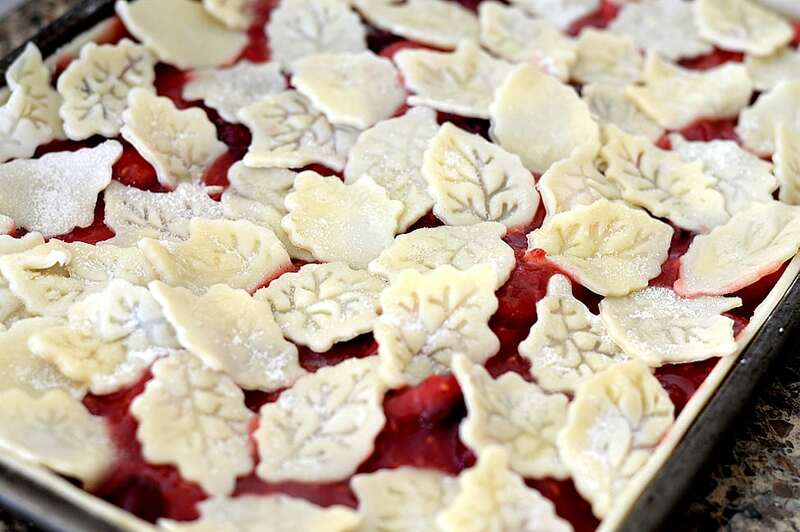 Using cookie or pie cutters, make shapes and place randomly over the filling, overlapping is fine. Lightly brush with almond milk and generously sprinkle with sugar. Bake at 375 degrees for about 30 minutes or until the crust is golden and crisp. Serve with a scoop of vanilla almond milk ice cream. Store covered, at room temperature. To reheat, place in the oven or toaster oven. I love the design you did on the top wit the leaves, its gorgeous! Thanks for sharing the recipe! Delicious!! !so will make this again. Change out the sugar with agave…. Where does the 1/3 c of shortening go? Is that included along with the 12 Tablespoons of vegan margarine for the crust? Did you line baking sheet with parchment paper as well? I can’t wait to bake it tomorrow. The filling is nyummy! I prepared both the dough and filling one day in advance! I would love to extend my thanks for posting this recipe. I made it last year and can’t wait to make it again this year! Originally I just wanted something that was fun to bake, like traditional non-vegan sweet treats, that would also fit into my mom’s vegan diet. This fit the bill to a T. My thanksgiving guests, vegan or not, all loved this! There just was not enough!! And, bonus: It tastes even better the next day, in my opinion. Thank you a million again! Happy holidays. Hi! 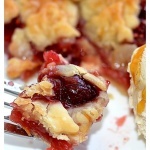 I plan on making this today, is the slab pie freezable? How long does it keep at room temperature? I’m so excited!